They say when you love something you will know it when you see one. We’re talking about sofas. Our latest fabric sofa collection is not only good looking, but at the same time cosy, charming, stylish, and graceful. It’s the first thing you will want to relax on when you come home at the end of a long tired day (too bad if you thought it was the bed). That’s because our sofas make you feel at home. No other sofa gives you so much freedom as Bellice (shown in the picture below). 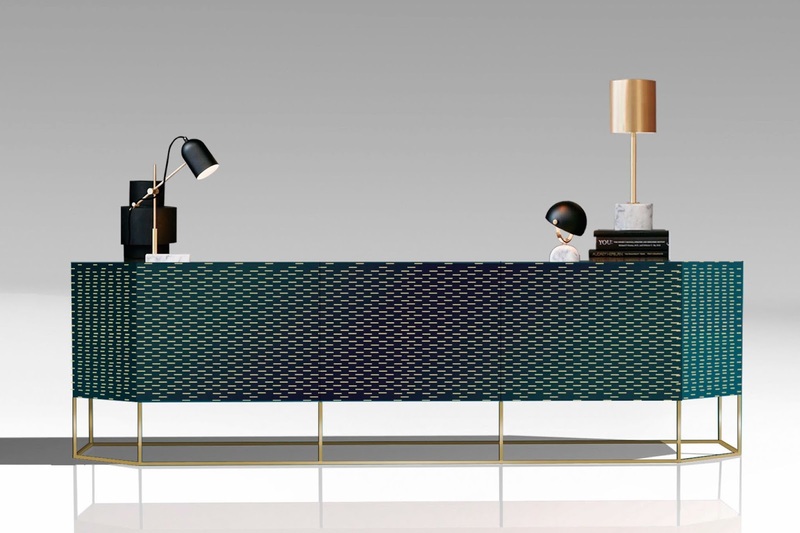 Completely modular, from Beck Design by Leolux is anything but ordinary. It works in umpteen arrangements from armchair, chaise longue, corner sofa, to sectional. With footstools, head supports in three widths and arm cushion variants. Unconventional, cosy and modular, the Pacific (in grey) sofa by Fama consists of six platforms of different measures which one can add or remove backrests to turn into a chaise lounge or an attractive curved sofa. Every time you feel your living room needs a new look, you just have to add or remove according to your wish. Inspired by the fifties, but retro-styled for the modern home Astoria (in light blue) by Fama is an eye-catcher from every angle. Adding a special touch are the legs, a contemporary upgrade of the classic 17th century design. Thanks to its attractive design and great comfort, Astoria can be coupled with any other furniture to make your décor look interesting. 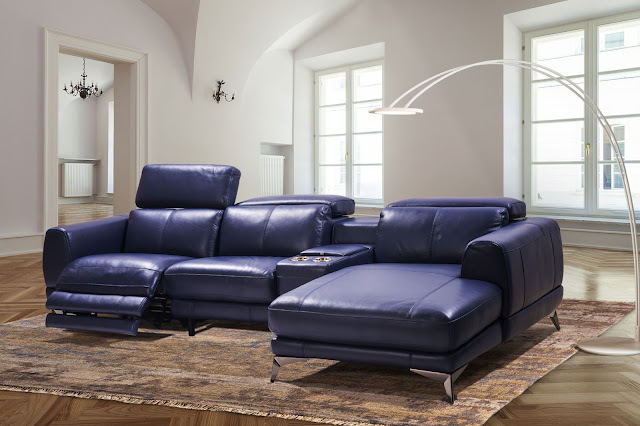 Dieses sectional sofa (below) by Natuzzi is compact and ideal for apartment living. It features an adjustable headrest, sleek wooden legs, and a stylish piping for the armrest. 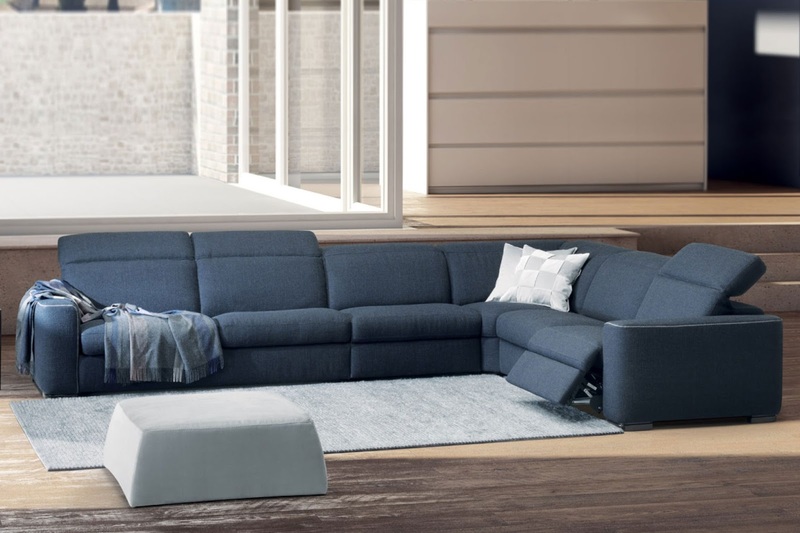 Other options include a sofa bed with the innovative Greenplus mattress, recliner mechanism with “zero wall” system; the seating and backrest move forward, inclining as the sofa opens so there's no need to keep it away from the wall. Dieses is versatile as it is available in several configurations to meet the consumer's space requirements. Showcased in the picture below is the much loved sectional sofa and the most versatile as well, Arianne Love lives up to its name with its inviting design and endlessly extendable modules. 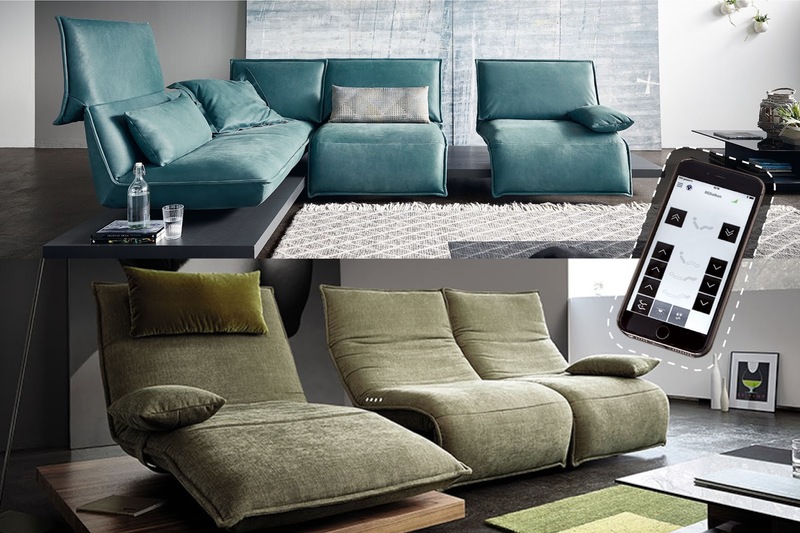 This latest model by Fama allows you to control the sofa through an app on your phone. You can raise the height of the sofa before or while you sit, making it perfect for older people too. Besides, you can customise this sofa in terms of look, size, colour, and print. Whenever you choose a sofa from Simply Sofas, you have the privilege of getting it designed in the choice of colour, size, shape, and material you like. Simply because we believe that comfort should be adapted to suit your lifestyle and taste. Visit us and get the joy of designing your homes beautifully and distinctively. Some of the best memories and intimate moments happen in and around our bedroom. The bed is the hero of the room, and that's where the attention is naturally drawn, which is why you want to make sure it looks great all the time. Wooden beds match any decor style and are the only way forward if you want something in both classic as well as contemporary. Stylish, modern, and elegant, we are happy to introduce our new bed collection that you will love. Among our renowned brands, Alf Italia, made in Italy, is very particular about their choice of materials, production technology, and design quality. The collection we have is simply beautiful and matches your personal preferences. Sleek and minimalist, Memphis bed makes one stop and stare. The beauty of the warm wood grain is highlighted with a grey erable inlay detailing. 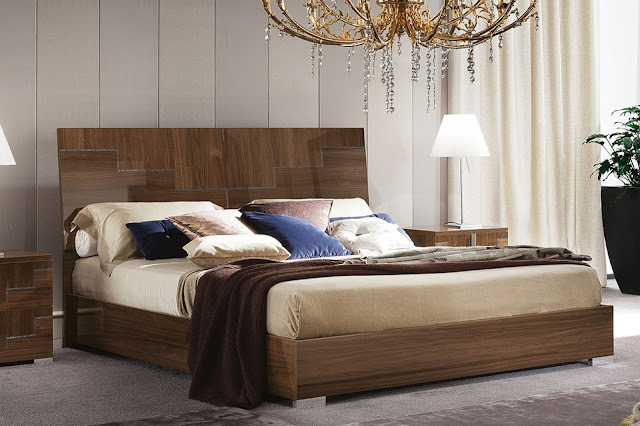 The bed is finished in walnut canaletto veneers with a high gloss lacquer finish that reflects available light to brighten any space. The eye-catching chromed legs emphasize the precision of the real wood veneers. If industrial chic is your vibe, then have a look at Accademia bed. This one is crafted in a beautiful and warm termocotto oak finish. 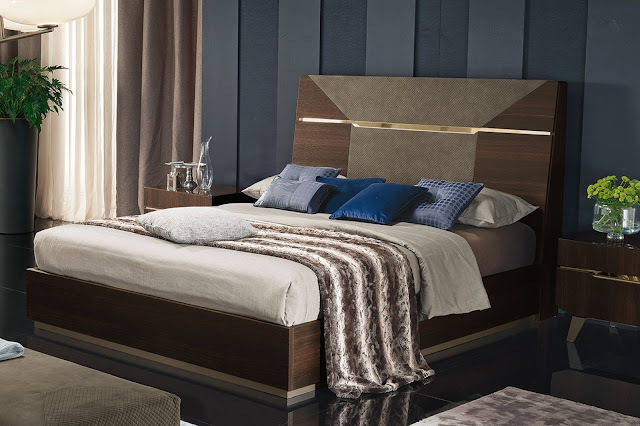 The understated headboard is composed of quilted upholstery inlays set withing the beautiful termocotto oak which makes it a defining statement. The bed is equipped with LED lights and golden-effect glass accents. You cannot go wrong with the classics and Matera bed is designed to inspire sweet dreams. Innovative materials and outstanding attention to detail, this bed has contemporary lines and a grain textured oak finish. 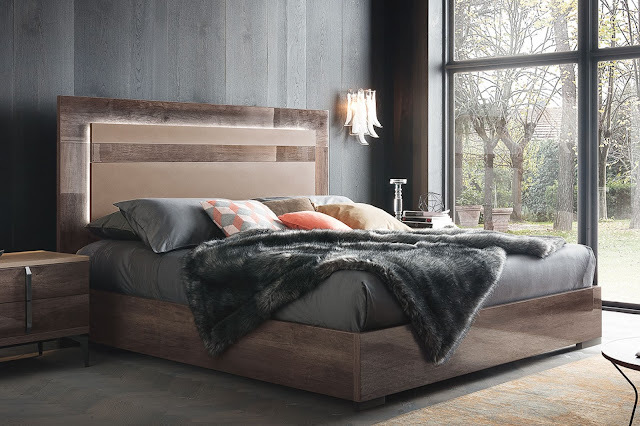 Strikingly stylish Matera modern platform bed comes with an ambient LED lighting for the headboard. This distinctive and classically traditional piece has the advantage of a high gloss finish which adds warmth and depth and creates the perfect addition to any bedroom setting. Comfort is given based on the pillows and the mattresses you have. But, when it comes to the bed it's all about the style, frame, the material used, robustness, and longevity that matters. So, choose wisely. Remember, whichever bed you choose, it’s also important to find the right mattress for a good night's sleep. Wooden beds are flexible that way, they cater to all kinds of mattresses. Check out our mattress collection here. And if wood is not your style, check out our wide range of upholstered beds here. Think Transformers the movie, which has these cars transforming into giant alien robots! Of course, our sofas wouldn't do that, but they transform to give you a seating experience like never before. You don't have to wait for another decade to see an evolution in sofas. It's right here. People have always needed somewhere to sit down and the modern sofas not only provide a comfortable seat they also change to your mood with a touch of a button on your smartphone. There are more interesting features that will probably leave you flabbergasted, so explore some of the handpicked sofas from the new and vast Milan Collection 2018. Imagine sofas that can give you individual space and also allow you to come closer to your partner when you want to enjoy some good time together. Well, Koinor with its crafted-by-hand and 'made in Germany' tag has made this a possibility. Epos and Edit are the two versions of the free motion concept. These at first glance appear to be normal sofas, but hidden behind the sleekness is the innovative technology filled with surprises and creativity. Thanks to the integrated motor, these seats rotate, move laterally, and come with adjustable headrest and can automatically adjust back and footrest. No wonder it is called the new dimension in seating, lounging, and living. And the best part is that the movement can be controlled via remote control or via Bluetooth or an app. Media station, sound system and led base illumination are optional features. These sofas are available as two or three seaters and in a choice of materials and colours. Designed by Tamara Harty. Meet Ascana, the stylish proof that comfort is an eternal bliss. The sofa features adjustable seats, headrests in varying heights, and matching footstools. Ascana is available in ‘Low’ or ‘Plus’ versions. The ‘Low’ version has no head rests. The ‘Plus’ comes with head rests that you can adjust assisted by a gas spring. To fine-tune your comfort, tilt the head rest by pulling the top towards you. With technology as the defining feature this year, Fama has added a new feature to the much loved sectional sofa Arianne Love. The sofa comes with its own app, to work for you all the more effortlessly. A click is all it takes to turn a sofa into a bed or to even raise the height of your sofa before or while you sit on it. Possibly the most versatile sofa ever made, Arianne Love lives up to its name with its inviting design and endlessly extendable modules. 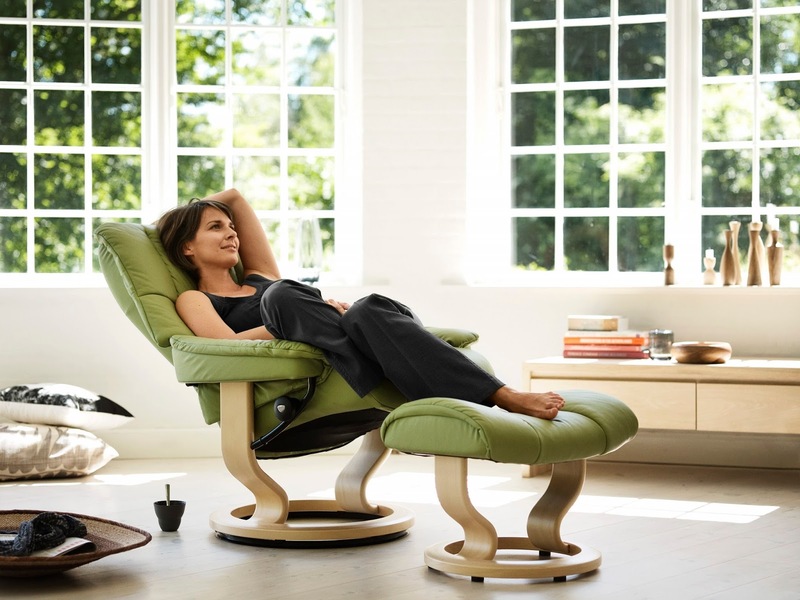 The MoonriseXL recliner is for couples who like to enjoy their relax moments together. The reclining system works with a remote control and can be stopped in different positions. This model has two independent adjustable headrests. If you don’t want to fall into temptation, you’d better not try it. Moreover, you will be left puzzled with, is it a small sofa? Or a big chair? The chic Indy offers many amazing positions from a sofa to a bed at the touch of a button, and all this without having to get up. The smart design of the motorised backrest system allows you to adjust the depth of the sofa and the position of the back, and it can be used as a recliner sofa for four people. All this can be controlled by the buttons from your smartphone via an app. The inviting Venice, is a sectional with a chaise longue. It has a motorised recliner seat with individually adjustable headrest and footrest, and a USB port. There’s a table to hold your drink as well. Beauty combines with innovation to achieve maximum comfort with the adjustable footrest and headrest, adaptable to your individual needs. The square and linear shapes of Iago combine in perfect harmony with the softness of the padding and give it a pleasantly surprising appearance. The version with the reclining function also has the exclusive Soft Touch mechanism. This lets you change the position of the seat and the backrest simply by sliding a finger on the buttons located between the seat cushion and the armrest to achieve absolute comfort. There are some furniture pieces whose absence makes the space look mundane just like a missing piece in a puzzle game, and whose presence adds more sophistication and functionality. The sideboard is one such. The sideboard adds to the aesthetic value of the dining room, completing the ensemble with table and chairs. Sideboards are essential - where would you keep your crystal ware, fine china, cutlery, glassware, cooking books and a lamp, or even display a grand meal for your guests? 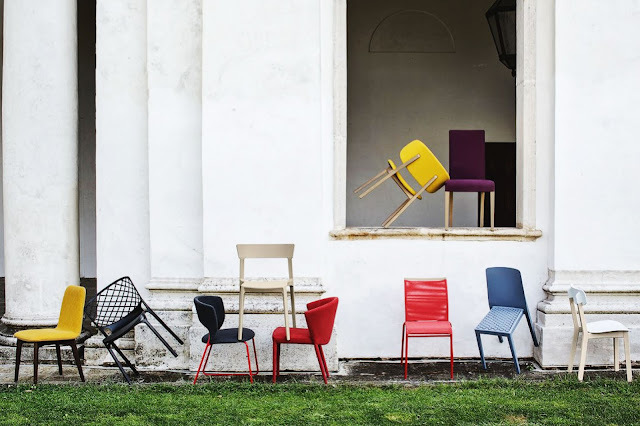 With the launch of the new Milan Collection 2018, we have the latest straight from the world's biggest design fair. Get ready to be inspired and fall in love. 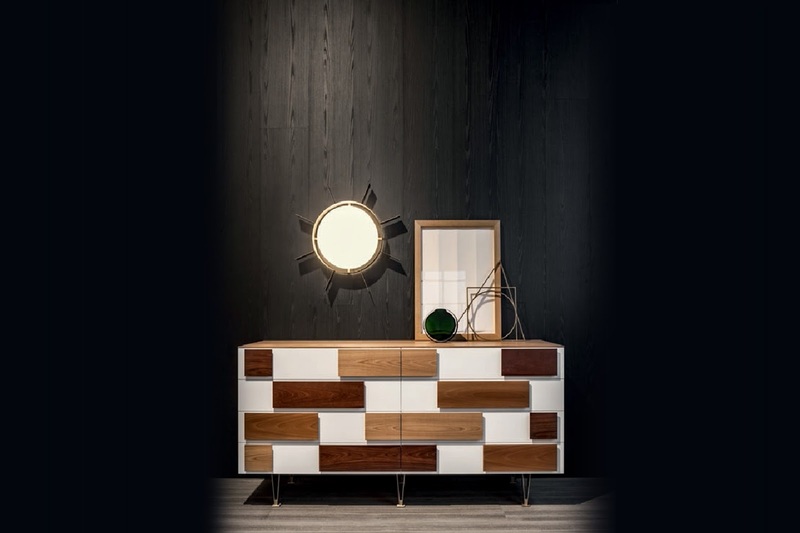 By Tonin Casa is the bold and chic Tiffany. With a quilted covering, this sideboard is in a Canaletto walnut finish and upholstered in rhombus patterned Ottanio leather. Truly a representation of Made in Italy. Classic in looks yet modern in function, the Alf Rigadin sideboard comes with solid wood oak panels in a finish reminiscent of the traditional ‘rigadin’ pinstripe pattern of Murano handblown glass vases. The unit sits on a lean steel frame and is capped with a marble top. Lines and geometry embody the striking Maya sideboard by Tonin Casa, with an embossed wood effect in Canaletto walnut. This distinct piece breaks the monotony of anything that is ordinary. 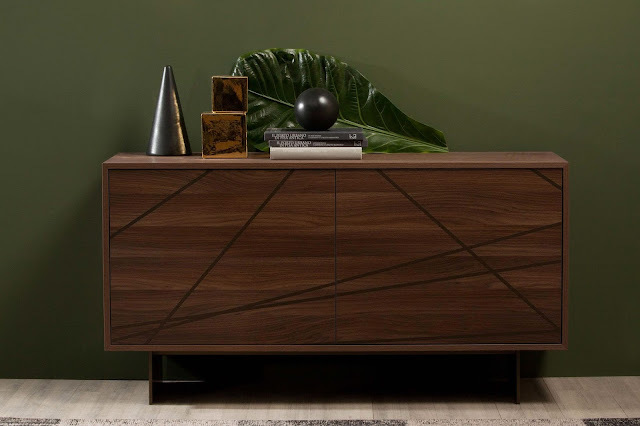 Bridging the gap between classical and modern, the Frame sideboard by Bonaldo is in an irresistible bold metal frame structure that stands in sharp contrast to the wooden panels. Designed by Alain Gilles. 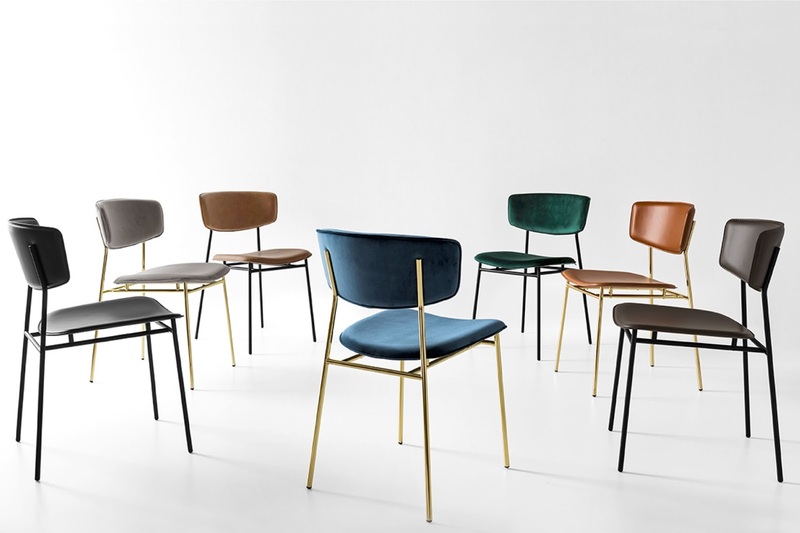 Inspired by the 70s graphics and an object of art, Shade by Bonaldo comes with a metal base and elegant bevelled sides to make its edges less sharp. 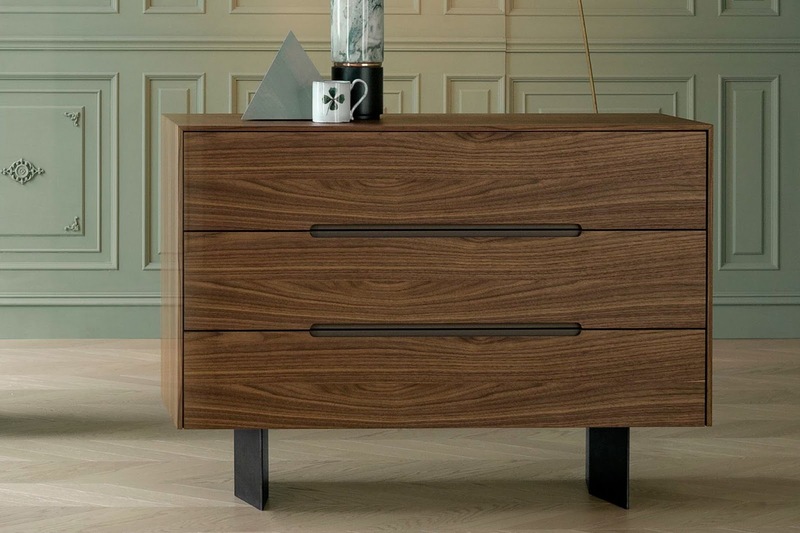 Here's a graceful Wai chest of drawers by Mario Mazzer for Bonaldo. The base takes its shape from the joined hand gesture, a sign of respect across the East, and the Thai for welcome. It has a metal base and wooden frame with recessed handles. Together they form a simple and stylish appearance. 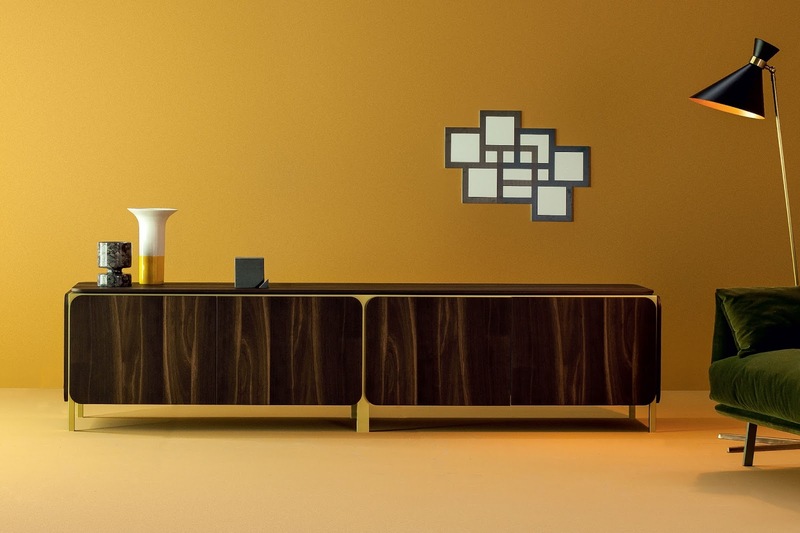 Contemporary and distinctive, Amber sideboard by Jamie Durie for Natuzzi. 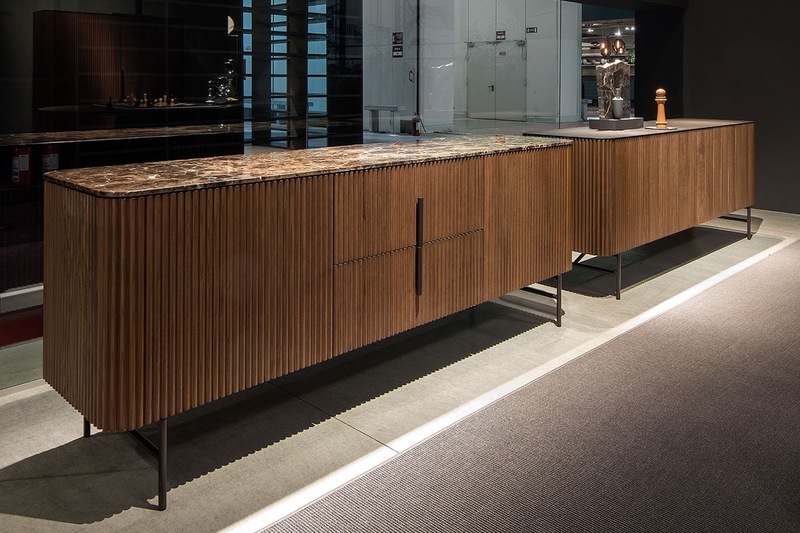 The decorative scalloped front face uses a custom CNC cutting path with a timber veneer overlay surface, resulting in a beautiful undulating sculptural surface. Versatile in nature, Honey works as a television stand and sideboard. Standing out with distinguished woodworking is the Canaletto walnut and heat-treated dark oak and glass highlights. 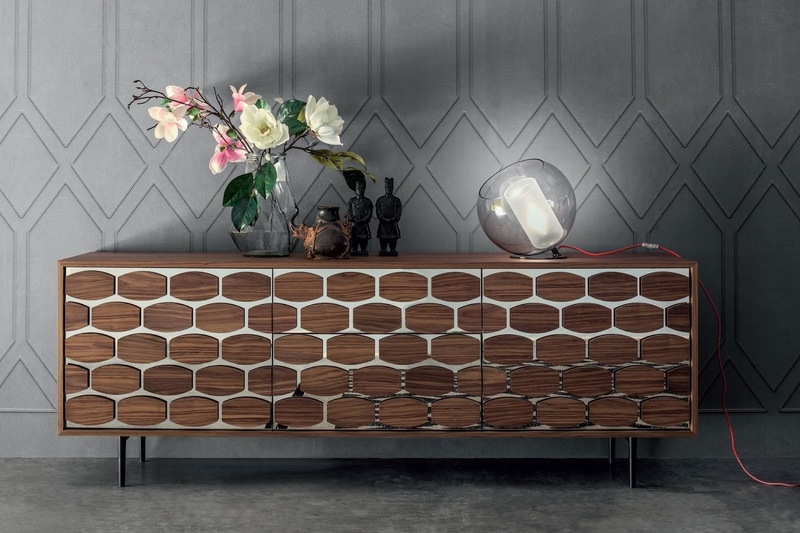 This beautiful beehive design by Tonin Casa is brought to life through skilled workmanship. The new collection is a visual treat in terms of design and structure. 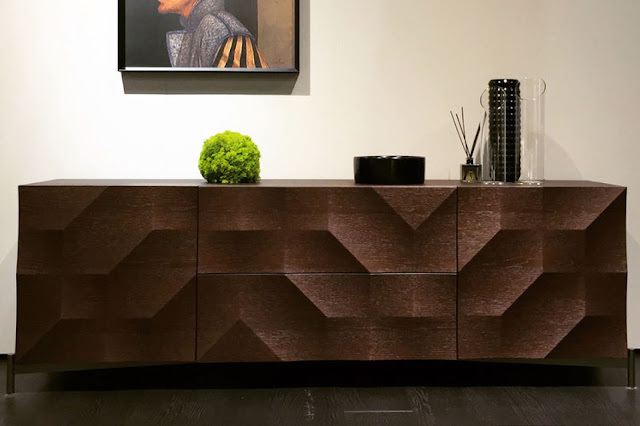 These sideboards are worked with different styles, colours, patterns, and finishes in unusual and exciting new ways to complement as well as balance with the existing decor in your room. Along with design and functionality, these pieces are evolved to fit changing decor styles and complement challenging interiors. The most important thing to do when choosing a sideboard is to make sure that it's functional and serves your need. *If you're an architect or an interior designer these latest sideboards are top notch for your interior projects. A story or a film with a good start and then a suspenseful climax is what we all love. And if furniture could do the same, won't it be enticing and magnificent? Here's a new label we have been waiting for. A name that tells interesting stories through designs and makes the climax beautiful, unanticipated, yet memorable. Or should we just say the less we say, the more you see? Molteni & C. The defining name in premium luxury furniture, is now exclusively available in India. At Simply Sofas, we are thrilled to bring this extraordinary brand to South India(mainly Bangalore & Chennai), specialised in high-end home furniture and premium luxury projects (such as hotel, ships, theatres, and public buildings). The Molteni’s collection features the exclusive work of some of the most prestigious architects and designers such as Foster+Partners, Gio Ponti, Jean Nouvel, Patricia Urquiola, Jasper Morrison, Michele De Lucchi, Tobia Scarpa, Vincent Van Duysen, Ron Gilad, Arik Levy, Aldo Rossi, Hannes Wettstein, Yasuhiko Itoh to name a few. And now, you can bring the work of these gifted designers into your bedroom, living room, and dining room. Italian at heart, Molteni & C' history goes deeply back to 80 years and is a confluence of exemplary design, cutting-edge craft and great tradition. Over the years, they have designed and built prototypes that have become mainstream, introduced new ways of crafting furniture systems that are architectural in every sense, and enlivened the homes of people who appreciate the technique, detail, and beauty. Today, the Molteni group can boast a 360° presence in the interior design field. Molteni & C designs furniture for the most intimate environments of daily living to large public spaces. The range of products offered by the brand include: sofas, armchairs, tables, chairs, wardrobes, single units, walk-in closets, beds, drawer units, bookshelves, accessories and rugs. Molteni's mission is to continually invest in research and technological development in order to provide products with a quality that lasts in time. What makes them different from other labels is their knowhow regarding materials, finishing, and personalisation of the product. Technology is an inseparable part of the brand as they constantly carry out work on new, innovative solutions. So as to say combining a long tradition of traditional craftsmanship with innovative technology to present the best to the consumers. While talking about Molteni, people also speak of hidden quality, alluding to the technical, functional and material quality present, but often unseen in its furniture. That's something unique to the brand. The designs go beyond your assumption and surprise you with their never-seen features. Always up-to-date with the latest trends, Molteni has living, dining, and bedroom solutions that reflect the new ways of living. Molteni is present in over 80 countries worldwide and has 40 flagship stores opened in the most important international metropolises. And, now making its way to Simply Sofas is an icing on the cake. 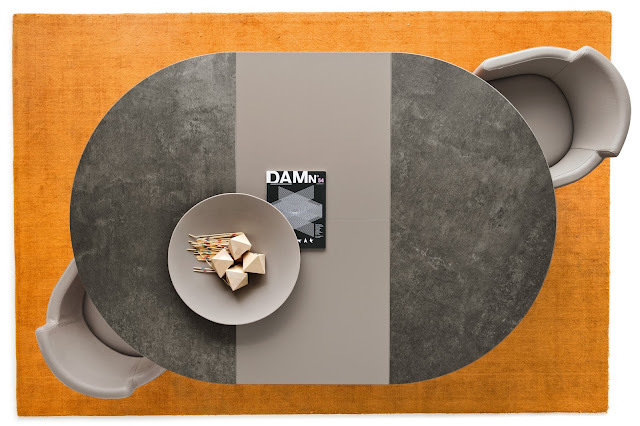 The latest ceramic dining tables can host the most exquisite parties and yet remain easy to clean and maintain. Without as much as a care in the world about the ensuing wear and tear. Technology is constantly changing the way we go about things. 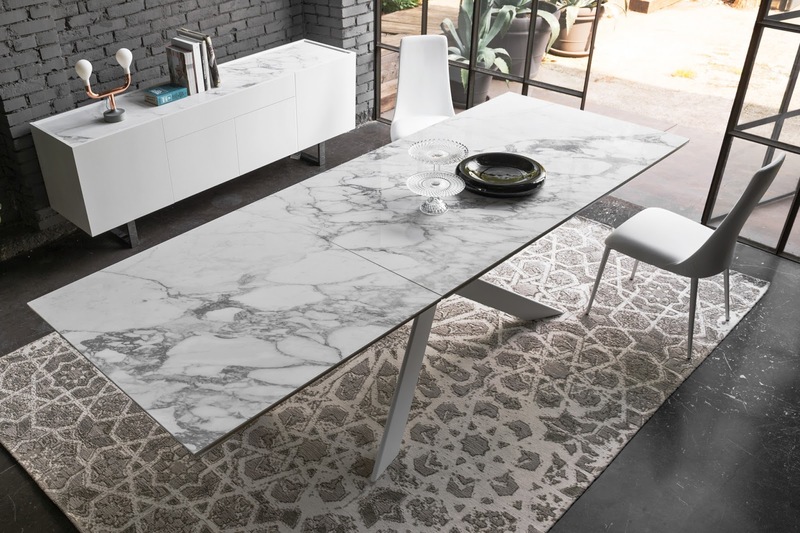 Meet the latest innovation that combines the beauty of marble and the strength of ceramic in tabletops that are scratch, heat, and stain resistant. The great big Milan 2018 collection is here with iconic pieces like the Calligaris Orbital, a Pininfarina design seen sporting the new marble over ceramic top. Exclusively available in a range of finishes at all Simply Sofas stores. Choose from dining tables for two or six to up to ten people. The Jungle fixed table in a marble print over a ceramic glass top and a double pedestal base with wood. Seen here with the Fifties chair in vintage faux leather and metal. 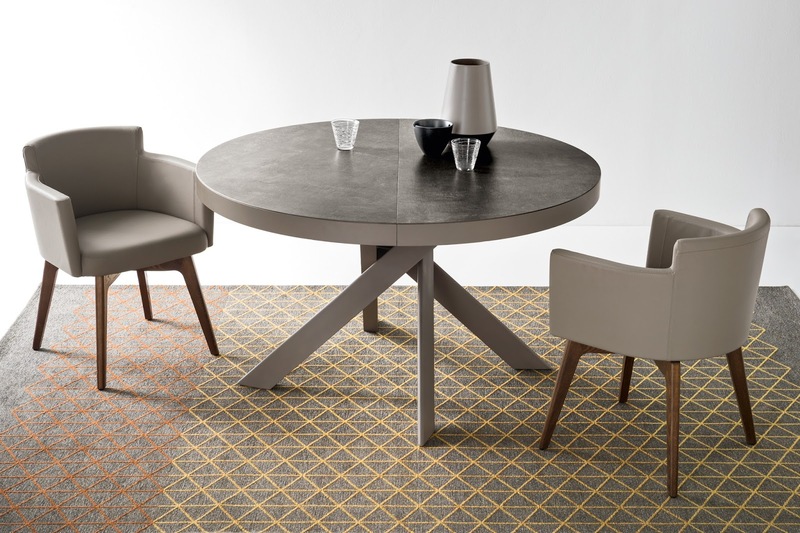 The distinctive Echo table with a honey-coloured marble print over a ceramic glass top that can be extended on both sides. Seen here with the Aida Soft chair in vintage faux leather. 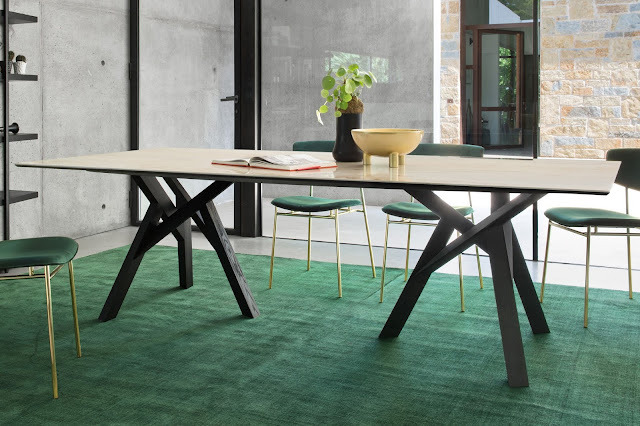 Sculpted, and adding more than a touch of style is Cartesio, the iconic fixed table, with a ceramic glass top and a varnished ‘V’ metal base in black. Seen here with the versatile Saint Tropez chair. A bold statement at ease in any environment. Extensible, sporting a lacquered wood base and in a ceramic top with onyx finish. Eclisse features a rotating co-planar extension mechanism. Cop stands apart with a base inspired by objects that usually adorn a table’s surface - bottles, precious stemmed and champagne glasses in various shapes and sizes. The top is available in wood, glass, or ceramic with rectangular or bevelled corners or in a round shape. Design by Roberto Paoli. 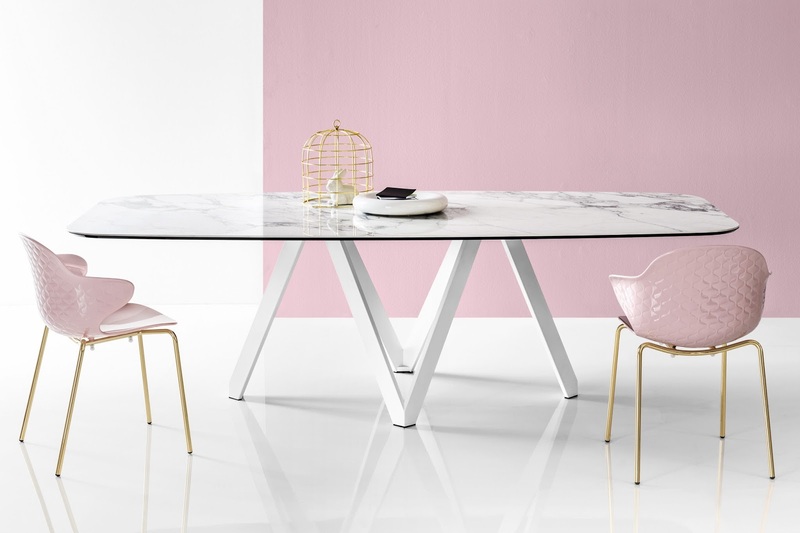 The Tivoli extensible dining table with its simple lines and all new ceramic, round top. Seen here with the iconic Igloo armchair in vintage faux leather. 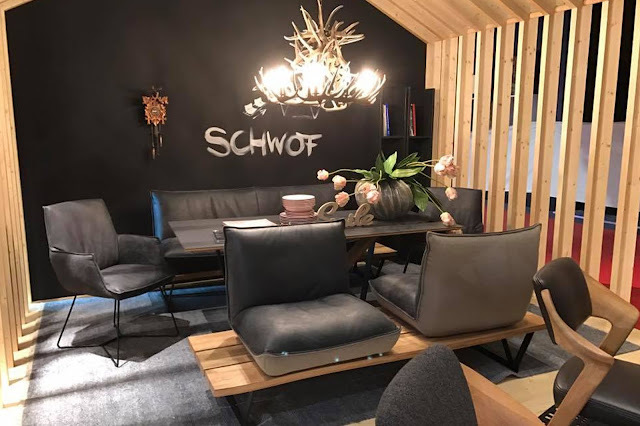 A unique dining concept, Schwof, comes with three seating options - a fixed sofa, a bench with upholstered swivel seats and chairs, and a table in a ceramic top with wood and metal base. We've always been steadfast to the vision we set 7 years ago - to bring the latest to India from the world's greatest show in furniture design, the Salone Del Mobile or the Milan Design Week as we call it. And just like we promised, it is here. Futuristic and ground-breaking. The latest and the largest Milan Collection 2018. Every year we bring the world's greatest designs to you, designs that are crafted by celebrated European designers whose passion for design is relentless. These original designs come along with patented features that are available to you in customised pieces. Underpinning this year's collection are the latest materials, the innovative features, the trending colours, the new patterns, and technology-based designs which take the centre stage. One of the main highlights of the latest collection is the touch technology as a new feature. You will see sofas that can shift with a touch of the button or through the aid of apps on your phone. The dining experience is more personalised and impactful with the stain, scratch, and heat resistant features. The collection comprises of sofas, recliners, sofa recliners, sofa beds, dining tables, dining chairs, beds, mattresses, wardrobes, home theatre seating, accessories and so much more. 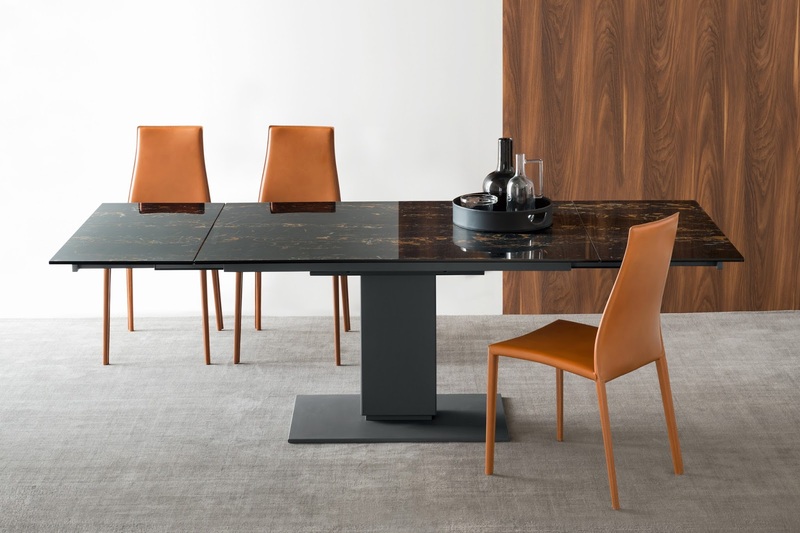 All by the world renowned brands in furniture industry - Leolux, Koinor, Fama, Natuzzi, NicolettiHome, Bonaldo, Tonin Casa, Alf Italia, Calligaris, Stressless, and Becker. The latest designs are made in Italy, Spain, Germany, Norway, and The Netherlands. All this so you can take pleasure in enjoying little moments of life whether it is relaxing on a sofa or sitting at your dining table. Each of the latest designs you see in our stores has the aha moment to it. All you need to do is visit our showrooms spread across 70,000 sq.ft in South India. Come, drop in to a Simply sofas stores near you. Set design plays a huge part in creating the look and atmosphere of a film or TV show. Sometimes, the furniture takes a background role, visually reinforcing the mood or the character's personalities. In some cases, the furniture lends itself to more profound roles, like a character’s sudden realisation or transformation. And in other cases, we see how interior design is used to enhance the action or mood of a scene or character. One way or the other, furniture shapes the atmosphere and characters in the film and shows. Here are some most iconic pieces of furniture in television and film history. The main character in the sitcom, Sheldon loves to sit on the left hand side of a simple brown leather sofa. It was bought for $100 and is a central theme to various episodes in the series. 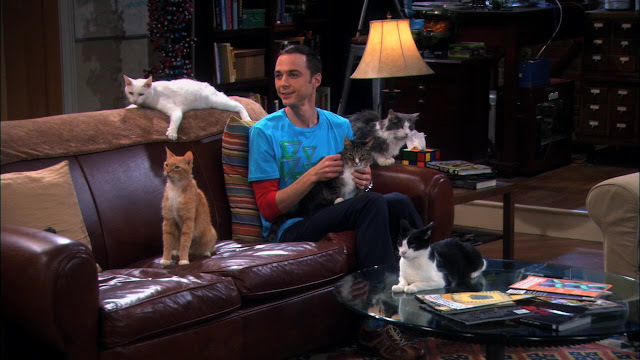 Sheldon perfectly describes his 'favourite' spot in the pilot episode. There's nothing special about the design but it does tie the room together harmoniously. 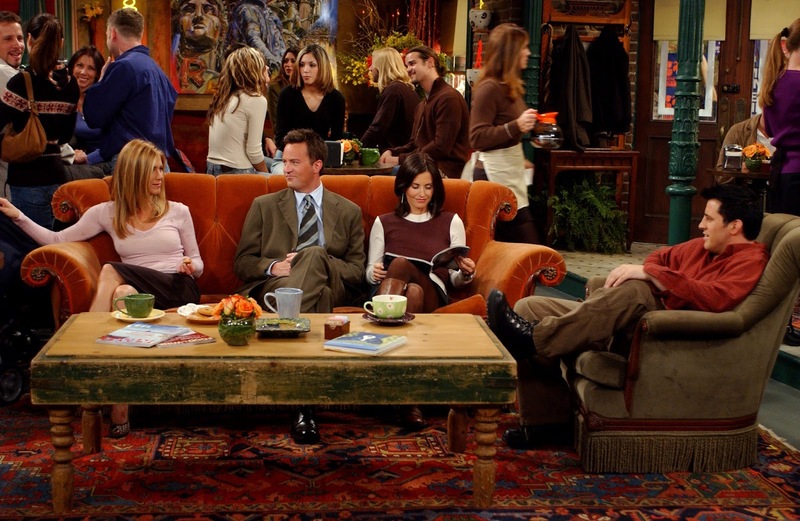 Running for 10 seasons from 1994 to 2004, Friends became one of the most popular sitcoms of all time. The orange coloured mohair sofa was a seat in the coffee shop where the characters in the show made it as their meeting point. It fits the decor of the Central Perk perfectly. In 2011 the couch was put up for an auction where it was expected to sell between $4,000 and $6,000. The final selling price remains a mystery. One can easily say it is the most famous sofa in TV history. 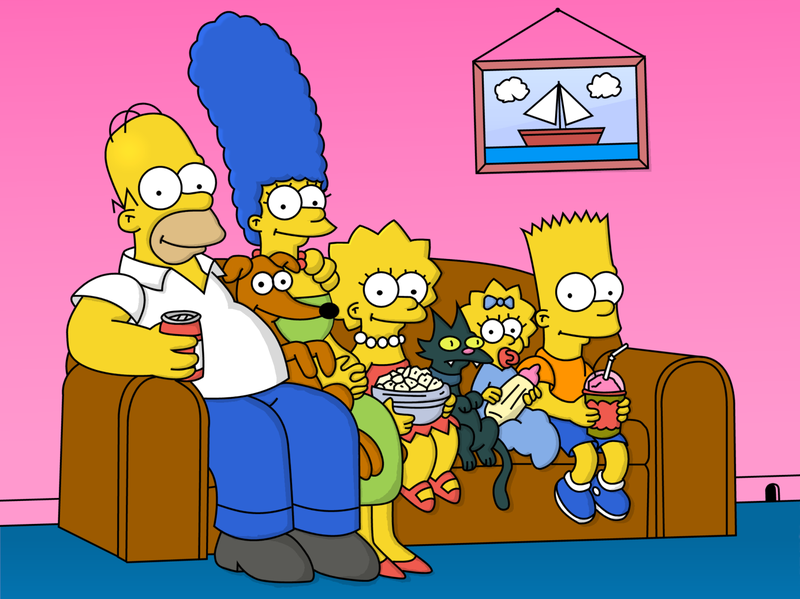 The longest running animated TV show, which across 29 seasons has a couch gag running just before the opening credits. Today the sofa is so iconic; it appears in every episode without fail. The gags in the opening titles have a satirical tone, with the whole clan rushing to make it to the simple brown couch in time to watch TV. Who would have ever thought that a cartoon could powerfully change the way we feel about our sofas? The popular talk hosted by Oprah Winfrey was started in 1984 till 2011 and penetrated into the American pop-cultural consciousness. She was snagging an estimated 7.4 million viewers an episode. 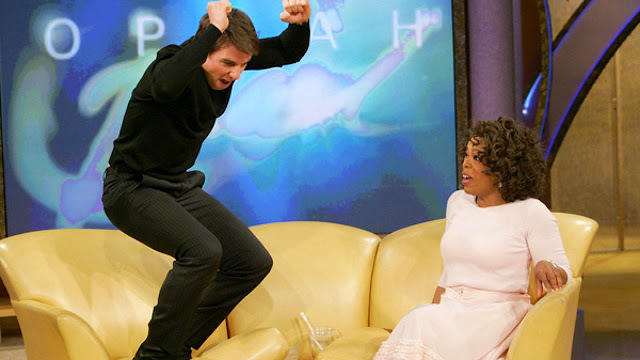 The cream-coloured sofa got its popularity when the actor Tom Cruise jumped on the sofa out of joy when he declares his love for Katie Holmes. 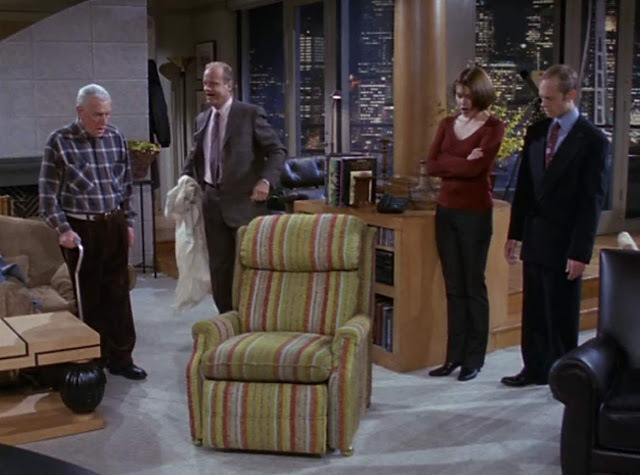 In the hit TV show, Frasier Crane has his designer furniture beautifully complementing his flawlessly decorated apartment until his father Martin moves in with his green striped Barcalounger. In spite of owning an Eames recliner with an ottoman, his father refuses to give up the chair which suggests that it was a comfortable piece of furniture. Designed by the Danish industrial designer Henrik Thor-Larsen, the Ovalia Egg Chair made its debut in the 1960s at the Scandinavian Furniture Fair. 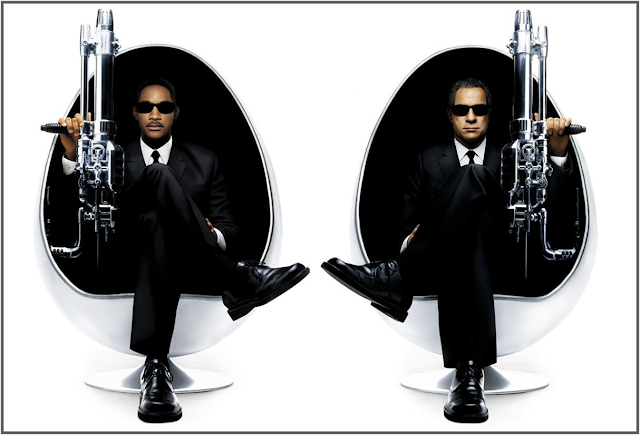 It featured in the films Men in Black and Men in Black II. The feeling of encapsulation makes egg chairs incredibly comfortable to sit back and relax in. 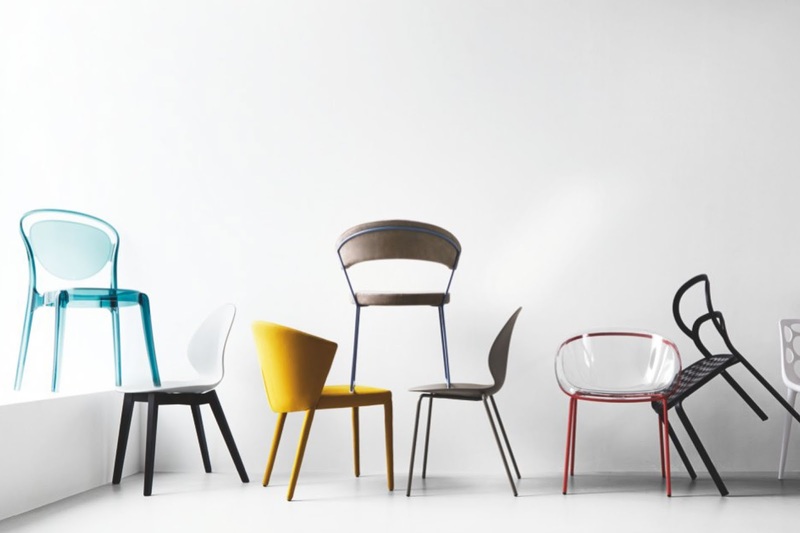 These striking chairs gave everyone a glimpse of what futuristic furniture could look like. The Imperial Throne held by Emperor Palpatine in the original Star Wars trilogy is one of the most iconic furniture in science fiction. The throne was the ceremonial chair utilized by the leader of the Galactic Empire, the Galactic Emperor. 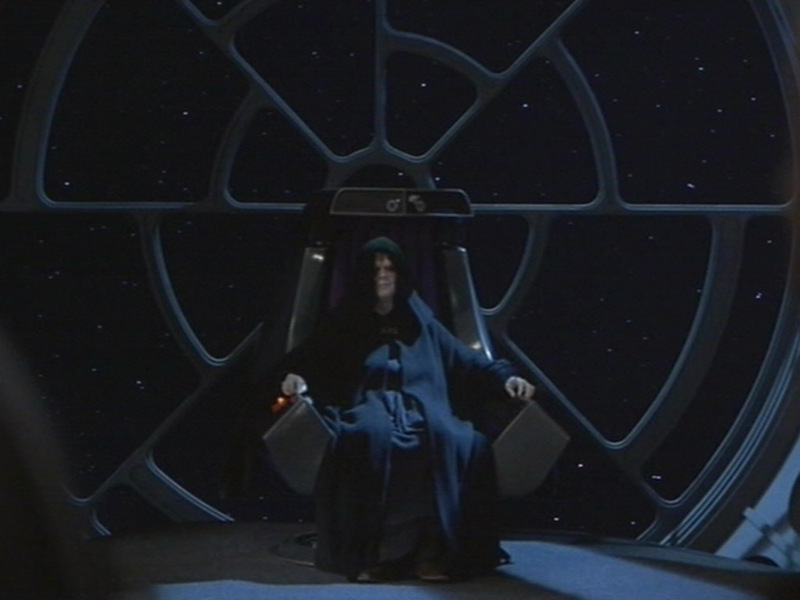 In large part because of its occupant, Emperor Palpatine, wearing plain robes and a cowl, the throne's design was primarily simple, consisting solely of a swivel-mount contour chair. On its armrests are control keys for enabling communications to Imperial officers, as well as the activation of a personal shield generator and a Royal Guard summoner. The throne captures the character perfectly and in the best possible way. In the popular TV show, hundreds and thousands of swords were bent in such a way to create that beautiful masterpiece - a throne. The iron throne is forged from over thousand swords that were melted down by the fiery breath of the dragon, Balerion the black dread. The swords were surrendered by the defeated enemies of the first king, Aegon the Conqueror. 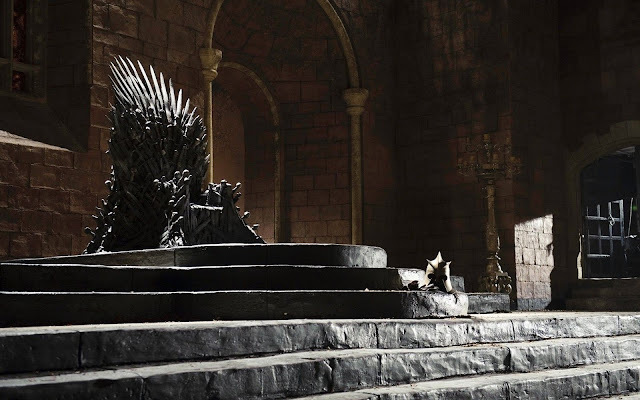 The symbolism of the throne is far deeper. Made of steel and swords, it’s a bold statement that evokes power and strength. 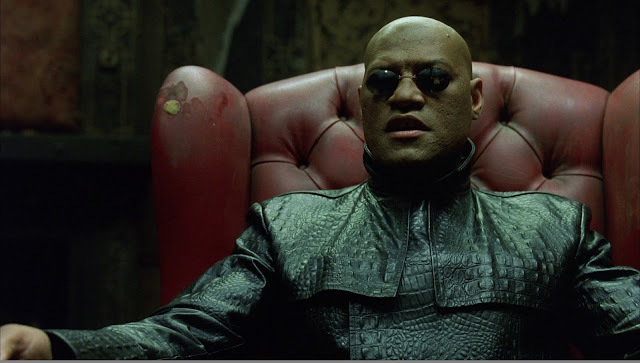 The red leather chesterfield armchair in the sci-fi film The Matrix is immortalised. The chair adds assertiveness to the character of Morpheus and makes Neo suggestible by falling for this offer. The chair really gives Morpheus an air of sophistication as he sits back and imparts his wisdom to Neo. Not only is it a great looking chair, it also looks very comfortable to sit in. Most of the iconic scenes in the film take place from this armchair. 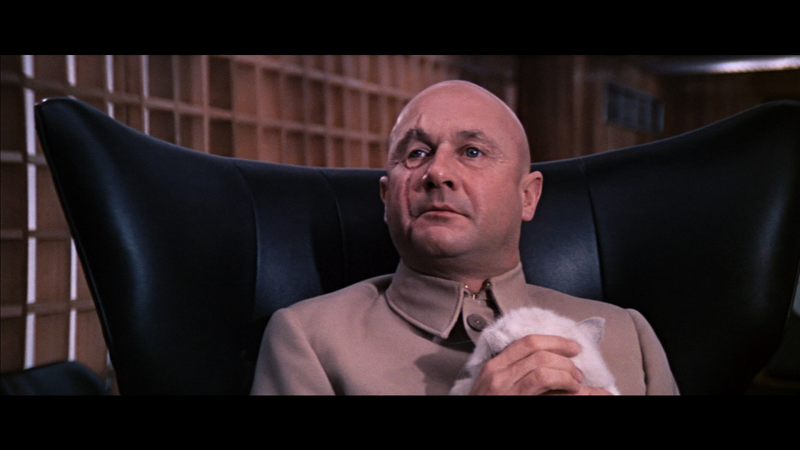 The famous leather swivel chair used by villain Ernst Stavro Blofeld in the James bond films also goes into the list of the most famous chairs. In the film, You Only Live Twice (1967), the villain sits with his white cat on the 6250 chair launched by the very British company G Plan in 1962. The swivel idea was borrowed from the very best offices in the 60’s, adding the appeal of rocking and the sheer convenience of gliding. The original chair from the Bond film set was sold in Julien's auctions for $16,000 in 2014. 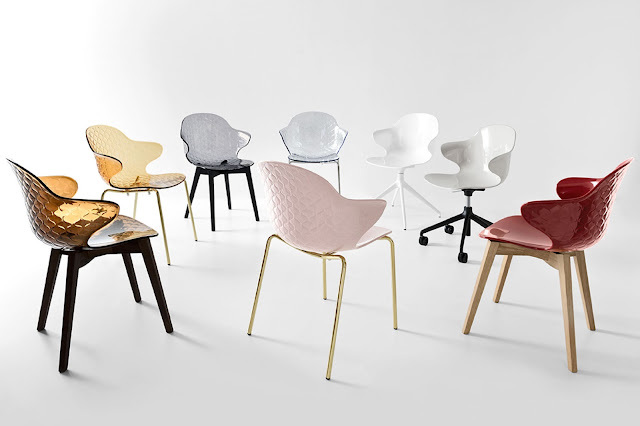 To mark the 60th birthday of G Plan, the brand reintroduced the iconic armchair and called it 'The Sixty Two', which was made with the latest materials and techniques so that it captures that same level of quality and comfort the original was renowned for. 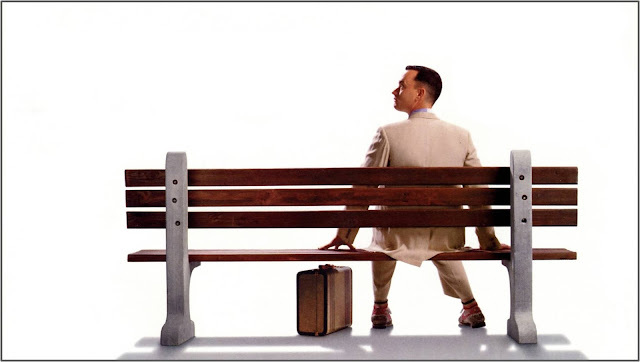 Based on a book, the Academy Award-winning movie Forrest Gump has the main character sitting on the bench next to a stranger and narrating his story. Today you may find a replica of the original bench in Chippewa Square in Savannah, Georgia so you can click pictures posing on it, but the original bench used in the movie has since been placed in the Savannah History Museum. Would you say it is one of the loudest piece of designer furniture ever made? Perhaps it could make a bold statement or add a groovy, humorous twist to a contemporary style home. 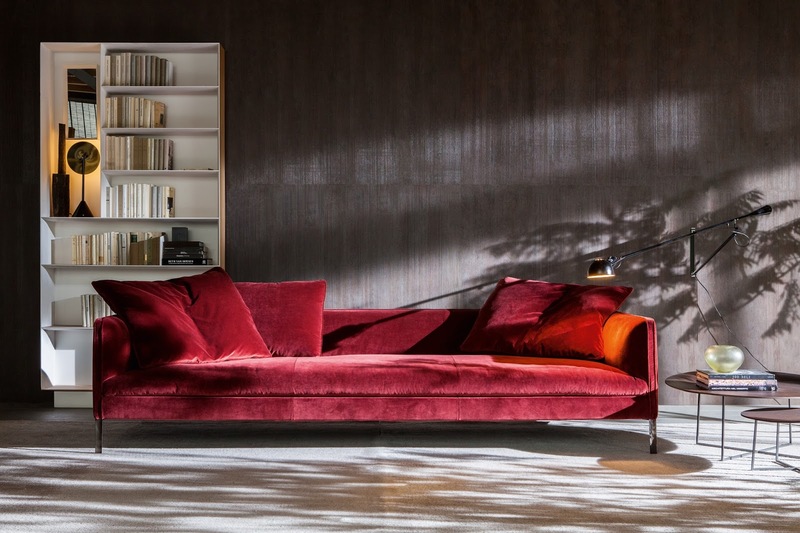 Inspired by Salvador Dali’s Mae West lips sofa, designed in 1936, the Bocca Sofa has been recreated in many forms over the years including Marilyn Monroe’s lips. Studio 65 Architects designed this masterpiece for Gufram which became a part of the pop culture when the sofa made its first appearance in the movie Austin Powers. 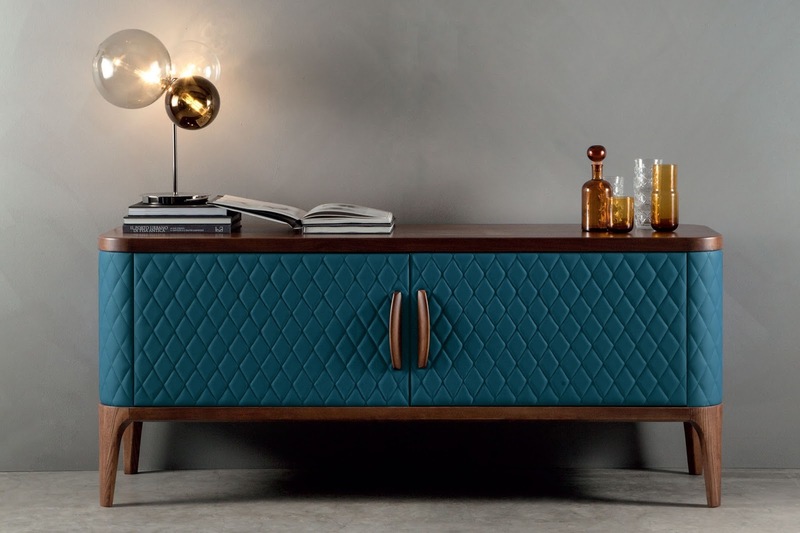 Today, Bocca is among the most sought-after, loved, and imitated products of home furniture. Breakfast at Tiffany’s furniture and decor set design is still fresh in our minds and the film has taken a rightful place in history as a true cultural classic. 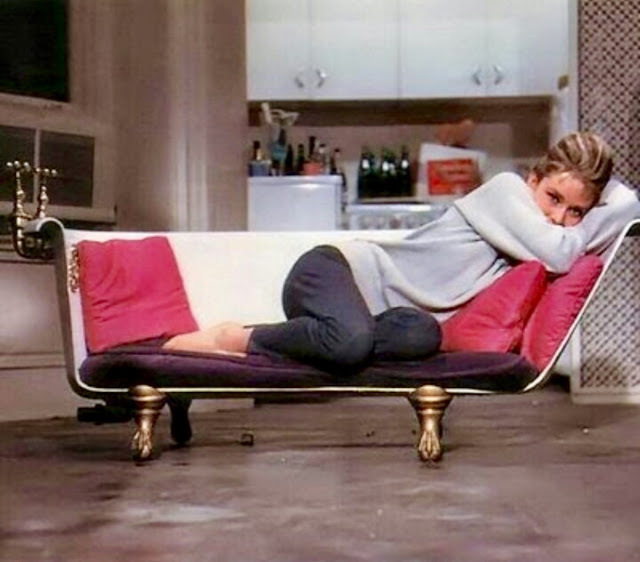 The unusual claw-foot half bathtub sofa which takes pride of place in Holly Golightly’s (main character) living room is cushioned with pops of colour in the otherwise neutral apartment which acts as a beautiful backdrop to the action and costumes. These pops of colour also symbolise her enigmatic and eccentric personality. Star Trek remains one of the most legendary science fiction franchises of the last century. Captain James Tiberius Kirk’s chair from the original “Star Trek” series is reserved for the commanding officer of the Enterprise. The chair itself has become so powerful in its implications, using the term ‘the chair’ has come to mean not just the acting authority, but all the responsibilities that come with commanding a Starfleet vessel. 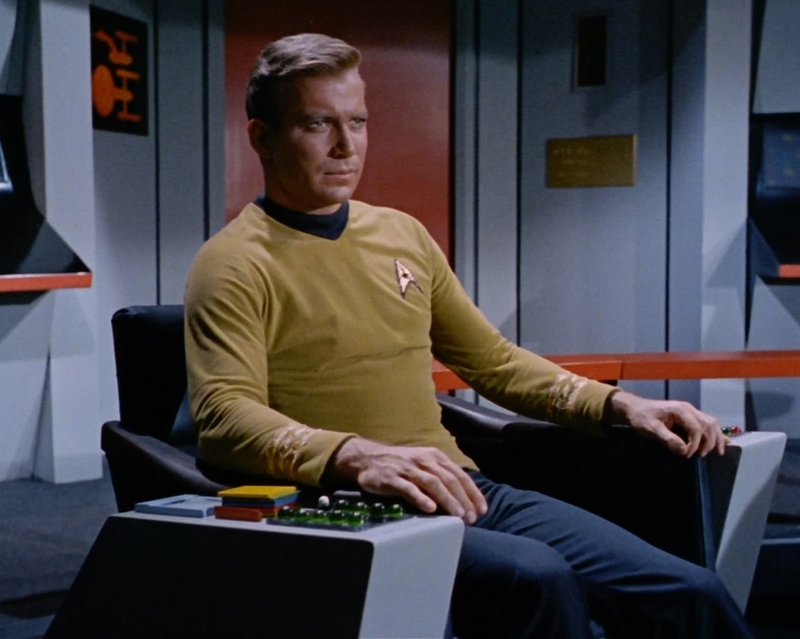 Many a scene took place which saw Kirk giving Chekov and Sulu commands from the chair while arguing with Mr. Spock. The chair itself was a very boxlike shape with a cutaway for the seating area. This was then padded with leather. In 2002, the chair from the original series was auctioned for $304,000 and then displayed at the Science Fiction Museum and Hall of Fame in Seattle. 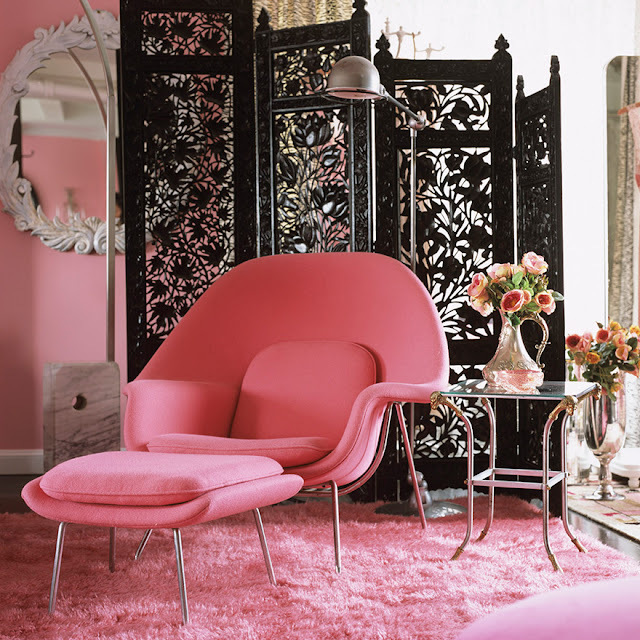 In the film, not one, but two pale pink womb chairs were found in the character Barbara Novak’s home. The scene where she’s on the pink phone, wearing that midriff-baring shirt and shorts along with these two chairs in her fine 60s apartment, teams with great choices of decor and furniture. Eero Saarinen designed the chair in 1948 in response to Florence Knoll’s request to create a chair to “curl up in”. This mid-century classic supports countless positions and offers a comforting oasis of calm—hence the name. Eames lounge chair - House M.D. The Eames lounge chair is the most popular furniture and which has become an icon of modern design and is easily found in many films and TV shows. The recliner is designed by the American Modernist designers Charles and Ray Eames. In House M.D., the character is seen sitting on this chair with his legs on the ottoman and thinking pensively. 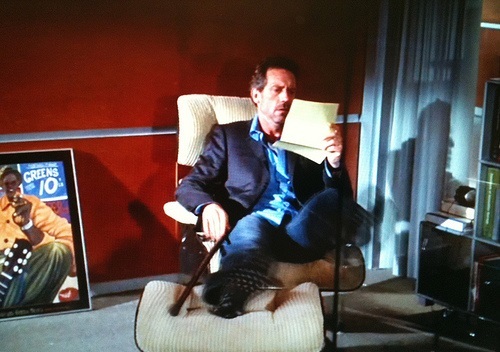 Dr House gets clues to solve some of the rare medical conditions when he is focused on his chair. The recliner is in a fabric cream colour and not the usual leather we see. The famous chair was designed by Ludwig Mies van der Rohe in 1929 for the International Exposition held that year in Barcelona. Started out as a luxurious object fit more for monarchs, the chair soon was in demand and aspired the most fashionable architects and captains of industry. Knoll took the production of this chair and today has a wide range of these chairs as well as other modifications. James Bond (Daniel Craig) sits in a Barcelona chair as he awaits the return of M (Dame Judi Dench) after breaking into her apartment in Casino Royale (2006). He stays seated as she tears into him; the lack of arms on this chair allows us to see him as vulnerable. One of the most recognized objects of the last century, and an icon of the modern movement, the Barcelona chair exudes a simple elegance that epitomizes Mies van der Rohe's most famous maxim–“less is more.” Each Barcelona piece is a tribute to the marriage of modern design and exceptional craftsmanship. 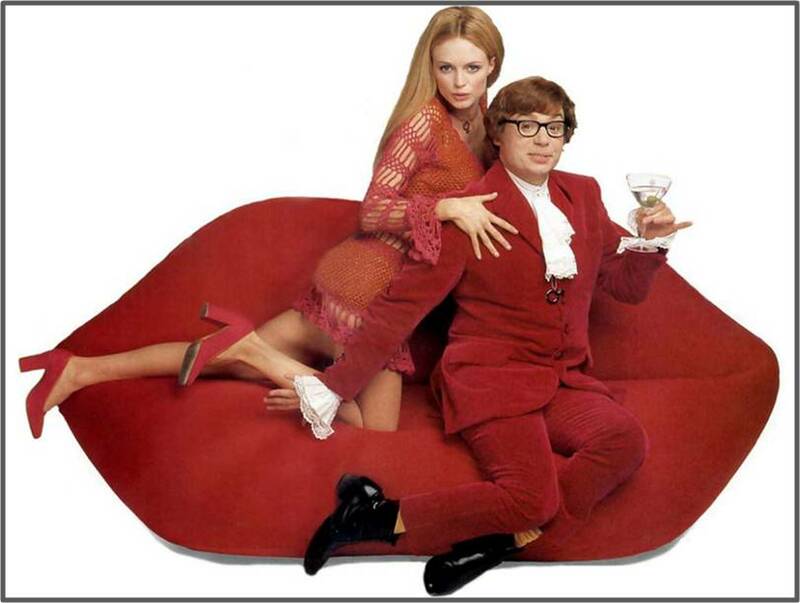 Other popular furniture seen in TV shows and films include - Jerry's couch in Seinfeld, The Foreman's Basement Couch in That '70s Show, The Wicker Couch in Golden Girls, Tulip Chair from Star Trek, Ox Chair from Austin Powers, Arne Jacobsen’s Egg Chair in Zoolander.